From the first time I saw them on the big screen in “Diary ng Panget” I was very certain that their chemistry will be a big hit not just in acting but also in singing. There was even a time when the playlist in my car was all JaDine,embarrassing but true. Now, JaDine is soaring Philippine TV ratings with flying colors with their first TV series, On The Wings of Love. 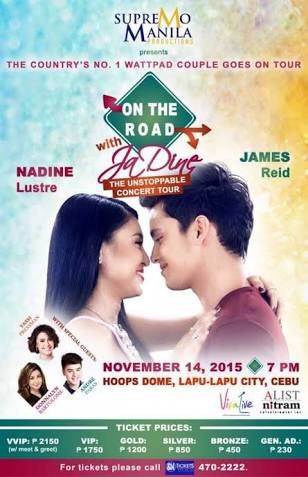 On November 14, 2015, tonight, JaDine will definitely rock The Hoops Dome at Lapu-Lapu City, Cebu on their On The Road with JaDine, The Unstoppable Concert Tour. Tickets are available at the door with Genral Admission at P350.00. Proceeds of the concert is for the benefit of Kababayen-an Sa Opon Nga Nagkahiusa Alang Sa Kalamboan (KONKA) Inc.